Ipsos Public Affairs has recently published a follow-up poll on Italians’ opinions about animal testing; Ipsos did the first survey on this subject in 2011, and the results were discussed in the Italian Senate the following year: many politicians were surprised to discover that opposition to animal research was considerably lower than animal rights groups made it out to be (activists have been repeating a claim that 86% of Italians are against animal research, though this figure does not hold up to professional polling stats released by Ipsos). 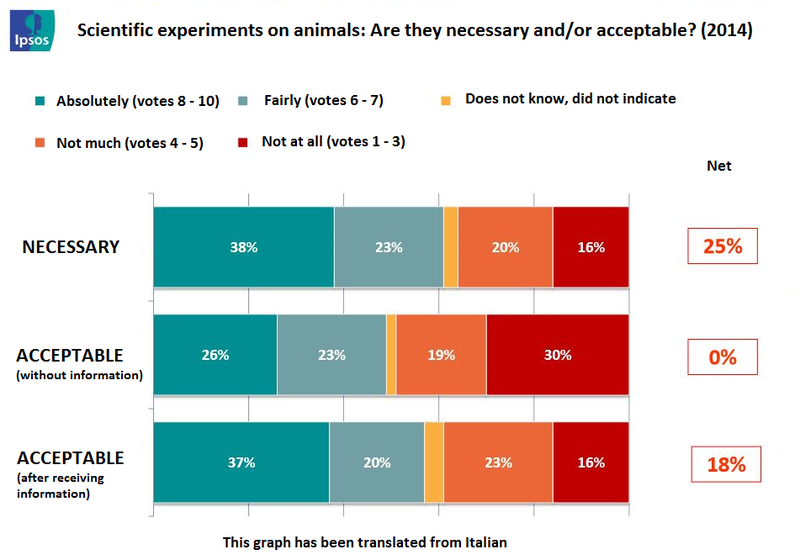 After three years, Ipsos repeated the poll to check if something has changed in the italian perception of animal research: this post aims to look at the positive changes that have occurred, and the swing in public opinion behind animal research. 1,000 people were surveyed in Ipsos’ research. As an example, in 2014 49% of the interviewed subjects think that experimenting on animals to test medicines is acceptable; in 2011, this number was much lower, only 33%. 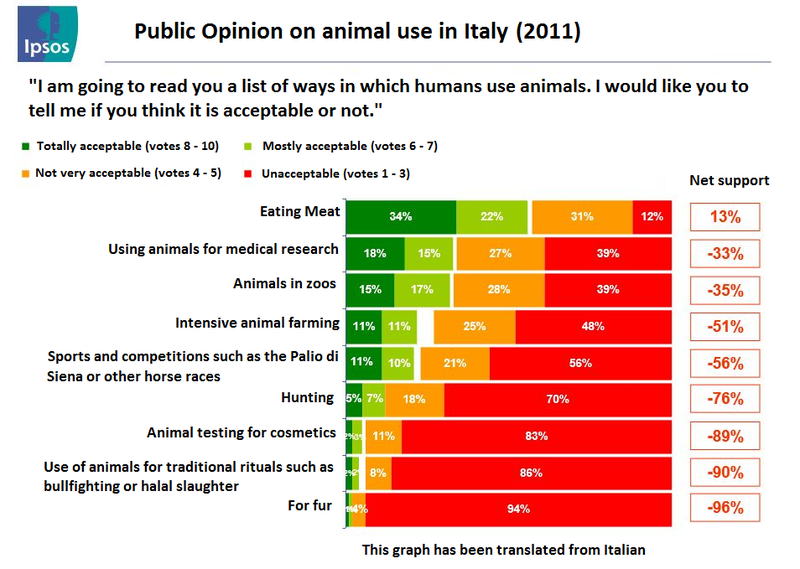 Italians are still very much against hunting (85% of Italians consider it unacceptable), the fur trade (95% said it was unacceptable) or experimenting on animals to verify the quality of cosmetic products (93% are against) – though it should be noted that cosmetic testing on animals is illegal in Italy (and thoughout the EU). 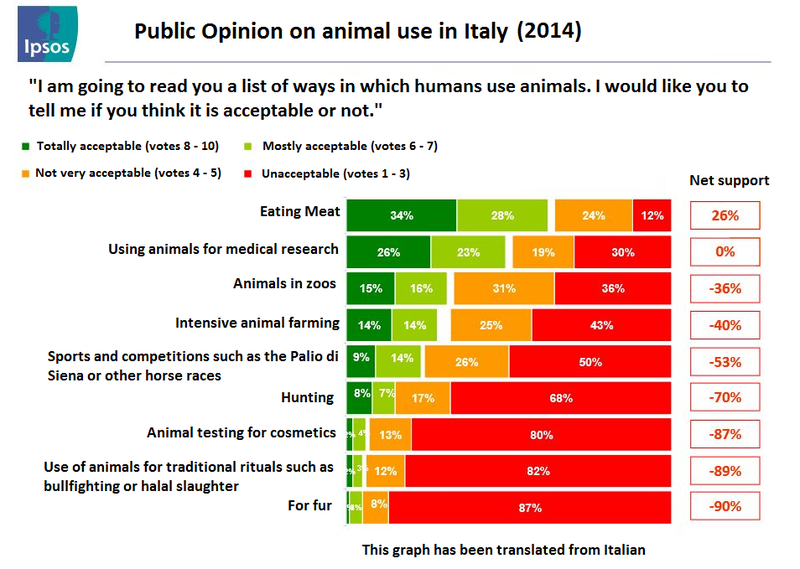 While there has been a minor fall between 2011 to 2014 on public opinion on this issue, the change is small and does not alter the fact that most Italians remains supportive to animal welfare causes. However, these days there are clearly more people that understand how caring for animals and supporting animal research are not mutually exclusive goals. Let’s examine the graphs further. In 2011, only 51% of the interviewees thought that animal research was necessary for medical progress. In 2014, this number has grown to 61%: that’s 6 out of 10 Italians. Compare this to the number of people that don’t think animal research is necessary for medicine – just 36%. 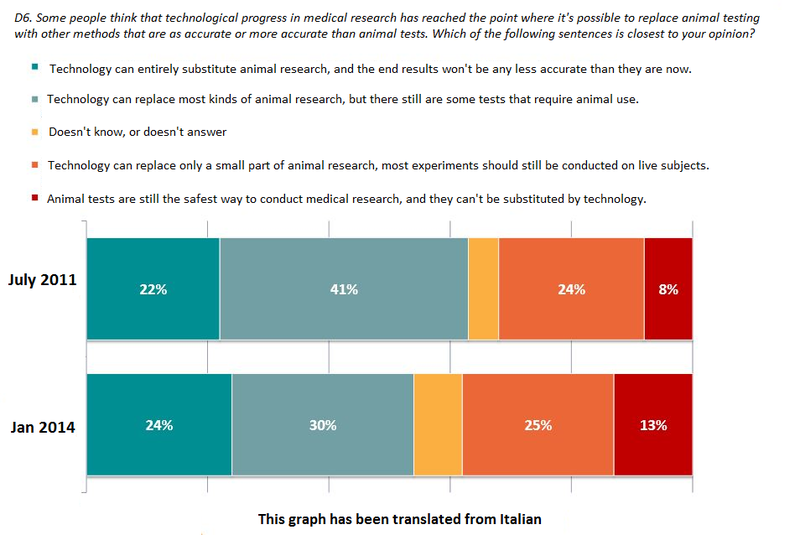 Animal rights activists often say that animal research is outdated, that technology can substitute animals for all kinds of testing; naturally we know this to be untrue, but what about Italians? What do they think about alternative methods? In 2011, 63% of interviewees thought technology was able to take the place of most, if not all, medical purpose animal tests. In 2014 that number has dropped to 54% (see graph below), pointing to a more realistic outlook on the actual possibilities of technology. This reflects an improvement in the information that people are getting about animal research. This is likely to be, in part, because of the public focus on animal research (due to the violent activities of extremists) and because of the information provided by advocacy groups such as Pro-Test Italia. These numbers are very encouraging, and they get even better. In both the 2011 and in 2014 Ipsos polls, the pollsters asked those surveyed whether they thought that animal research for medical purposes was acceptable or not; the subject’s answer was written down, the interviewer then provided information regarding animal research to the participant (such as the way European regulations protect lab animals’ health and well-being, how suffering is limited and regulated, and so on), and the initial question was repeated (“in light of these informations, do you think that animal research is acceptable?”). After being informed of the way lab animals are cared for by researchers, many subjects changed their answer; the harshest critics of animal research (those that answered “it’s never acceptable”), went from 30% down to 16%, while strong supporters of animal research went from 26% to 37%. The 2014 Ipsos poll confirms what we already discovered in 2011: when people are correctly informed about animal research, their support of it grows noticeably. 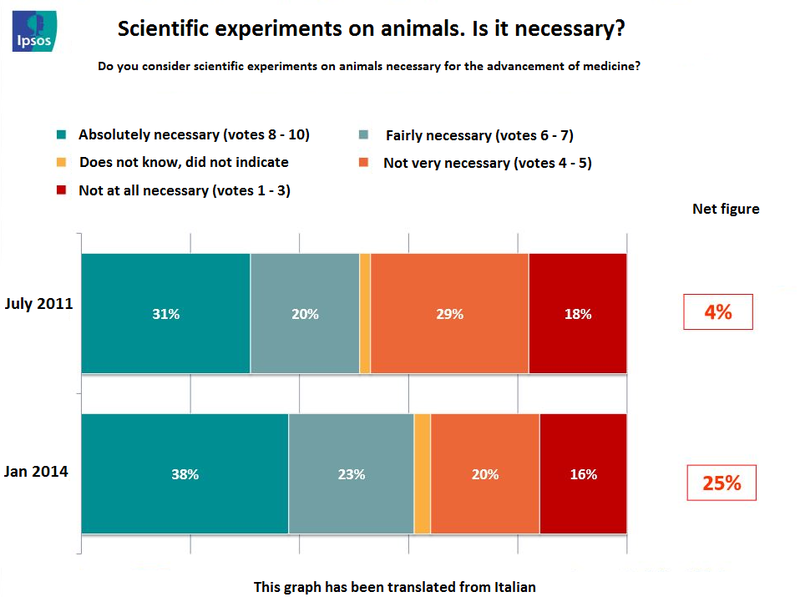 However, the 2014 poll showed an increased awareness of the general public in regards to animal research and its importance in the development of new drugs: this is no surprise, over the last few years Italian scientists and researchers started fighting back the “no vivisection” movements, with the support of new associations such as Pro-Test Italia. To cut a long story short, providing accurate information about animal research remains key to giving people the means to form an educated opinion about animal research, and with an increase of knowledge on the subject, there’s also an increase in animal research’s acceptance. We have a long way ahead of us, but we’ve definitely started on the right foot. Posted on January 20, 2014 May 2, 2014 by EditorPosted in Campus Activism, News, Outreach NewsTagged 2014 poll animal testing, animal testing opinion, Italian animal research, italy animal research. I have only addressed a number of concerns with aspects of this post, and attempted to refute things I did not agree with. Nonetheless, I will stop replying. If a vaccine helps a large number of humans, but a small number of humans are imprisoned and experimented on in order to test the vaccine, you cannot fairly claim to have cared for those humans that were tested on. There is a reason why humans use animals to test on – it is because the testing is not pleasant. I’m not sure how you define significant suffering, as there are a lot of other factors in the animal testing process which would determine how bad the animal’s life is. But it is undeniable that there are serious animal welfare issues associated with a large number of animal testing operations. “Humanness” is not a logical factor in not causing pain or suffering. Animals share many qualities with us. They feel pain and joy, and they seek to avoid suffering. Even if a human cannot say “no, please don’t hurt me”, (eg mentally disabled persons or infants) does not make it acceptable to hurt them. You should look at animal treatment objectively and rationally, as opposed to what is socially acceptable. Society has deemed acceptable many practices which cause significant suffering (as I have mentioned before, slavery and sexism, and even modern forms of human rights abuses), and not challenging these things based on the fact that “a consensus has been made” to me is very anti-scientific; it is ignoring new evidence and perspectives. The issue of suffering is valid when in the United States alone, tens of millions of animals are used in research, and when someone is claiming that animal testing and caring for animals are not mutually exclusive, I would have to disagree; it is saying animals’ lives and quality of life is less important than human life, or even human comfort. If you really cared about animals, would you not seek to minimize tests done on them which would not prolong human life or significantly increase human quality of life? This is no longer anything to do with Public opinion in Italy. Please contact us directly if you would like to explore this further. Caring for animals and supporting animal research ARE mutually exclusive goals. Nobody would perform laboratory experiments on a human against their will and claim to be caring about this human – same would go with their own pets. The fact that they cannot consent only makes it worse. It is undeniable that a large number of animal testing operations cause the animals to suffer immensely. I disagree. Rinderpest killed over 100 million cattle. Thanks to animal research the disease doesn’t exist. How can this be outside the goal of caring for animals? It is not that the animals cannot consent, it is that the concept of consent is meaningless to the animal. Also, while some research will cause significant suffering, most does not – the use of pain relief is mandatory in most situations. If a thief broke into your home and stole your pet, this would be a violent act whether or not they threatened you. Similarly, it is a violent act to break into a research facility and steal the dogs inside. Also the law by and large is a consensus on what society deems acceptable. The animal rights lobby is forcing their ideals on ill people. The issue of suffering is not relevant here, but the principle of pursuing your own beliefs regardless of the legality. From what I know of it, the activists referred to never threatened or were violent to anyone. As for the “violence”, those who test on animals are inflicting violence. Just because something is legal, does not make it acceptable. I think animal welfare advocates are much more effective when they are within the framework of the law, though. The anti-abortion community are forcing their own ideals upon women, in the support of an embryo/foetus which is not capable of suffering. Whereas those who test on animals force violence upon the animals, who are powerless to stop the violence – I don’t think it’s a fair comparison with animal testing. They are extremists when they are prepared to take illegal actions to push their views above those which are legally recognised. The only time extremists are mentioned in the article is with reference to violent and illegal activities. I did not see anything about these people doing violent activities, just rescuing beagles from test facilities. It’s not really valid to label something as “extremism” just because it is opposed to what is legal, for example, slavery has been legal in the past, as has been failing to grant basic rights to women. Currently, ag-gag laws prevent animal cruelty in farms from being exposed. So either way, calling them “extremists” is an ad homeneim and does not fairly refute animal welfare advocates’ issues with animal testing. Cutting through fences, breaking into a facility, stealing animals in both illegal and violent. It is thus an action of the extremist fringes. Extremist is not an ad hominem, it is a perfectly legitimate definition. Be careful of supporting illegal activity just because you believe their cause to be right – while we may support the anti-slavery movement of old, the anti-abortion community has also used violent illegal actions to pursue their goals – we should also consider them extremist. Animal research may save lives of humans. But I think it’s unfair to claim these people are extremists just because they value the lives of dogs in a test facility as much as the average person would value their own dog. I highly doubt the majority of average people, if terminally ill, would be ok with their own pets dying for animal research to prolong their own life a little bit, so being generally opposed to animal testing for medical purposes is not a case of extremism, nor anti-science, but the absence of having two internally conflicting ideals about how we should treat “pet animals” vs how we should treat “research animals” (because they are the same animals, the only difference is out attitudes about them). You have said people change their minds when they are informed of the way animals are treated by researchers, yet most people do not actually see how the animals are treated, and it is generally unwise to trust claims about the humaneness made by someone with a stake in the industry. Meat companies and a number of other companies (eg sweatshops or cocoa production) claim to operate with high ethical standards, yet investigations often show this to be contrary. One example is that reports of beagle testing for osteoporosis treatments in NZ showed they were treated badly; they weren’t taken for walks or given attention, and this went on for years. And you may be thinking “but it’s for the health of people” but really, if you are only dealing with the efficacy of animal testing, then yes it is for the health of the people, but it’s not just about that, it concerns dogs dying and having unpleasant situations forced upon them. Rather than labelling animal welfare advocates as “extremists”, it would be nice for more vocal scientists to start acknowledging that there are a number of complex and logical reasons why someone might oppose animal testing, and realise that being indifferent to animal suffering reinforces negative stereotypes about scientists.